Last Monday, it was the time of year to go and gather the moor for clipping. Dad, Luke and I started just after 6 o’clock, as we had to go further to collect the sheep than others that went gathering. We went up Lodge moor. It was fine, and the sun was just starting to come out. One reason that we went early was because sometimes it gets too warm for the dogs and they struggle to gather in it. But it was cool compared to some days and the dogs did really well. I took Fly with me and then Tip decided she wanted to come with me too and both of them did well. Luke took his dog, Meg. It was her first time going round the moor, but that didn’t stop her, she knew what to do and she didn’t seem to become tired. My Dad took his dog, Susie, he had to go further around the moor and she did well, but by the time we got to the bottom she was becoming more tired than the other dogs. Once we had gathered the sheep together, we sorted them into different pens. 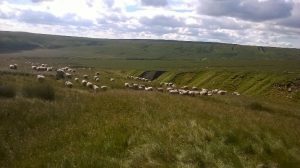 The moor is shared grazing, therefore the others that have their sheep on the moor come and gather at the same time and the sheep are all gathered up together and sorted out into separate pens. Each farmer has their own pen and there are five pens to sort them into. The pens have probably been there nearly 1,000 of years and are situated next to Stean Beck. They are next to the beck because they used to wash the sheep in the beck. It must be about 100 years since they finished washing the sheep. Everyone helps sort the sheep out, so we get on well and get the sheep taken home to be clipped of their winter coat. 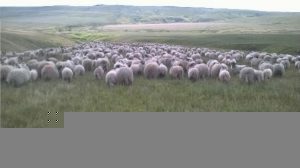 But this year, as the weather has been unpredictable, we decided to clip the sheep at the moor as the week was looking like it was going to be busy. It takes over 2 hours to take them home and then 2 hours to take them back and to clip the sheep, so the day is ending before we can do anything else productive on the farm. So, we clipped them there and had them clipped by six o’clock. When we started clipping it was extremely hot, so it was just slightly warm clipping! But that didn’t last long, as about an hour after we had started, it started raining and it never stopped and become torrential. But despite the rain we got them all clipped and marked with the colour they correspond to in the same day as gathering them, which was a bonus. 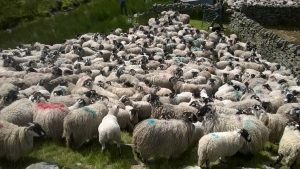 Once we finished clipping, my dad walked the sheep back up the moor to where they are going to graze, that was the easy part – getting the wool from the pens back to the motor and trailer was the biggest job, as it was all to take back to the top of the hill. Because it was wet, it was heavier and took more hard work to achieve. Once we got home, we had to hang the wool up to dry because the sheep were wet when we clipped them. It only took a day for them to dry once the fleeces had been hung up, which was a job for my grandad to do whilst the rest of us were working away.